Once installation is complete, accept the EULA and the Region screen will launch. Touch the field that says This Phone Number and enter your mobile number for this device. This is required in order to provision services to your phone correctly. 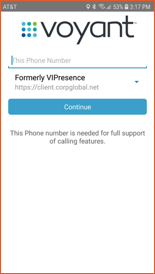 Voyant Connect: Choose this option if you were previously running an application called Voyant Connect for iPhone, Voyant Connect for iPad, Zen Connect for Mobile, or Zen Connect for Table. Your sales representative or Administrator will let you know which option to choose if you don’t know. Make a selection and then touch Continue. NOTE: Don’t worry if you choose the wrong one. To change it at any time, touch the gear icon in the lower right corner of the login screen above, then choose Edit Login Info from the menu. Select the other region option, save and then retry logging into your account. 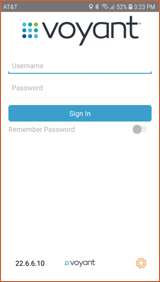 When you first login, you may be asked to accept a number of permissions such as access to the camera, audio and contacts. These are needed to provide video calling, audio calling and contact integration for outbound calling and inbound caller name matching. Once you have successfully logged in, the first page loaded by default will be your Contacts page.